Long time readers will remember my empassioned editorial on the subject of replaceable versus sealed batteries a year or so ago. Although putting forward the various arguments for and against the concept (and quoted below), it's clear that I come down clearly on the 'replaceable' side of the fence. Not that the industry listened to me, with almost most designs in recent times coming with sealed batteries. But do see below for an illustrated example of one of the things which can go wrong with a Li-Ion battery. To me, the 'disadvantages' of sealed batteries are almost showstoppers, yet still the industry (Samsung aside) persists in this integration. Perhaps coincidentally, perhaps not, Samsung, the biggest manufacturer in the industry by a country mile, is fully committed to replaceable batteries? Could it be that people (like me) really do want this feature in our phones? Quite a bulge! What's happening is that part of the internal chemistry inside the Li-Ion cell has broken down, physically changing the structure of the electrolyte and causing the production of (potentially dangerous?) gas. The solution for my (now quite old) Nokia C7 was simply to throw this misbehaving cell away (responsibly) and to slot in a spare BL-5K that I happened to have lying around - and all was well. 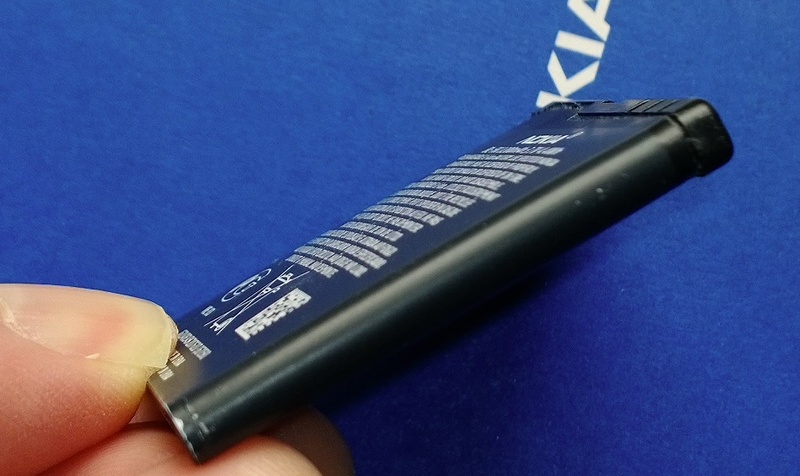 But the exact same thing could happen to an internal (sealed) battery in one of the modern flagship Nokia Lumia devices, or to that in an iPhone or Xperia Z or whatever. What would happen in practice if such a battery fault developed in a sealed design? The charging/performance would get markedly worse and the battery swelling would put strain on the other internal components. If in warranty, the phone could be taken to an authorised service centre, of course, for the battery to be swapped and (if necessary) the device replaced. Out of warranty, you'd be looking at a sizeable repair bill, from the battery cost and labour to dismantle and rebuild the phone, to paying for a complete replacement. So yes, a cautionary tale and hopefully a situation that most people will never face. But surely this is yet one more reason for manufacturers to stick to designs in which the user can check on - and replace - the battery if needed? I've a feeling I'm going to be ranting about this for several years to come. Thankfully, my Symbian devices (with one exception) all have replaceable batteries. In the Windows Phone world (this being AAWP too), maybe I should go buy a Samsung Ativ S after all? Comments welcome - I suspect others will also have string feelings here!